TravelTrex GmbH was founded in 1999 in Cologne and initially specialised in the direct sales of ski holidays with the brand SnowTrex. For this field alone, the company has become Germany's largest tour operator for winter sports holidays within just a few years. Since 2005, SnowTrex holidays have also been sold internationally. After a successful entry into the Polish market, the French and British markets followed. As of now, the website is available in 13 languages. With this aspect, TravelTrex is one of the most successful, international winter sports tour operators. Since 2007, the company also markets all-year holidays with the brand HolidayTrex. The main destinations are primarily the Alps and German coastal regions. In 2012, SpaTrex and SportsTrex additionally went online for the German market, specialising in spa holidays and sports holidays, respectively. In an official ranking of the largest German tour operators, the company came in at number 38 for the 2016/2017 tourism year. In the following tourism year, 2017/2018, around 109,000 guests went on holiday with TravelTrex. 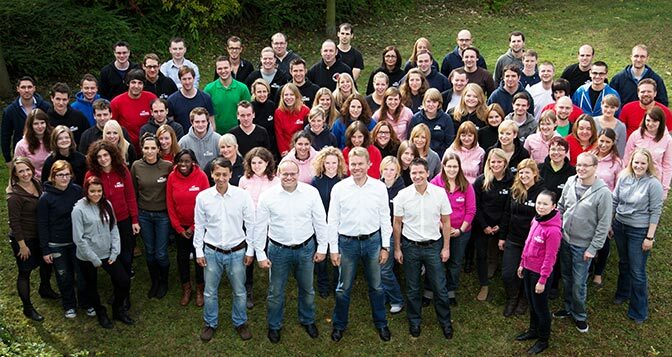 Our team now counts more than 100 employees, from over 15 different nations, including a number of apprentices. As an apprentice company, TravelTrex GmbH has received awards several times. The company trains young people in three different professions with emphasis on IT and tourism. The executive board of TravelTrex GmbH: can be seen in the second picture: (from left to right) Andreas Rühl, Marc Behrmann, Stefan Willems, and Thomas Bartel. SnowTrex holidays are characterised by simplicity and clarity and are based on the customer's expectations on individuality and service. Our packages include accommodation and lift passes, as well as different extra services such as ski lessons and equipment hire. In most resorts, a wide selection of different accommodations and categories is offered, so that different target groups can find a suitable offer. Holiday categories based on different demands, such as family-, spa- or luxury holidays, help customers find suitable offers.